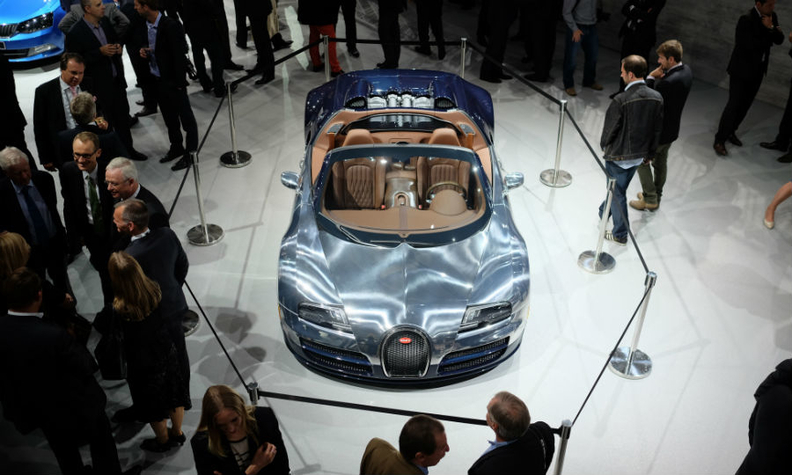 Bugatti showed the Ettore Bugatti legend Veyron in Paris. The car is named after the brand's founder and just three models will be built. PARIS (Reuters) -- Volkswagen keeps lavishing money on supercar maker Bugatti, its most exclusive brand, even as the German group plans painful cuts in its core auto business. Bugatti is working "very intensively" on a successor to the Veyron, CEO Wolfgang Duerheimer said in an interview at the Paris auto show. The Veyron is a limited production line of 450 models that start at 1.46 million euros ($1.8 million). It has a top speed of over 400kph. The Veyron successor's 16-cylinder engine may deliver even more power than the current model, Duerheimer said, declining to be more specific. The Veyron's remaining 20 units may be sold out by about mid-2015, he said. The opulence at Bugatti, whose 1,200-horsepower models seek to appeal to the world's richest buyers, contrasts with a growing push for austerity at VW's passenger-car brand where management is seeking 5 billion euros of cost cuts by 2017. "Of course, this can be painful," VW CEO Martin Winterkorn said at the show when asked about the automaker's efficiency drive. "At such a large company, there are always things to be found" where costs can be lowered, he said. Bugatti doesn't seem to be on Winterkorn's agenda even as the Veyron loses millions of euros per vehicle, Singapore-based Bernstein analyst Max Warburton said. The Molsheim, France-based manufacturer enhances parent VW's technology skills and pushes engineering boundaries although many people don't associate the marque with the German group. "In terms of soundly developed vehicles that are also pieces of art, you won't find anyone else who can compete with us," said Duerheimer, who also heads VW's ultraluxury Bentley brand. Earnings at VW and its flagship luxury divisions Audi and Porsche help to subsidize Bugatti. Neither VW nor Bugatti comment on development costs. Yet, there are signs that VW's stable of ultraluxury brands is not immune to the quest for efficiency.Italian supercar maker Lamborghini, also owned by VW, has yet to get approval from the German parent for a plan to build an SUV that was presented two years ago. CEO Stephan Winkelmann said in an interview on Friday that the SUV may come to market in 2017 or 2018, slightly later than previously expected, pending the decision by VW headquarters. "The decision should be taken, I cannot say when," the CEO said.